Anyone who has been reading my blog has noticed that I like to complain that I am too busy. Well, since my last post, I have found myself even busier! As the head of the national coordinating council of faculty unions, it now rests on the shoulders of my colleagues in the coordinating council and myself to negotiate a new salary agreement. Given that we have no such agreement since Jan 1st 2010. We still have work to do. Anyway, I wont bore you with these details (I have enough of it as it is!). I'll simply write about what I really like, and that is science. Two months ago my family and I spent a night in a beduin tent near Masada, together with a friend who celebrated her birthday. The tent is actually right next to the Masada airstrip, which is in fact the lowest air strip in the world, at 1250 ft below sea level. After everyone fell asleep, I was myself too warm to do so (more about it below). So, I decided to experiment with my Nikon D90. I didn't have a tripod, so I made a makeshift one out of a few rocks. To get the best results, I needed to set the exposures at typically 20-30 secs, and stand still! Also, I found out that if I let my head cast a moon-shadow on the camera, I get a nice halo around me. Here is an example of my results. 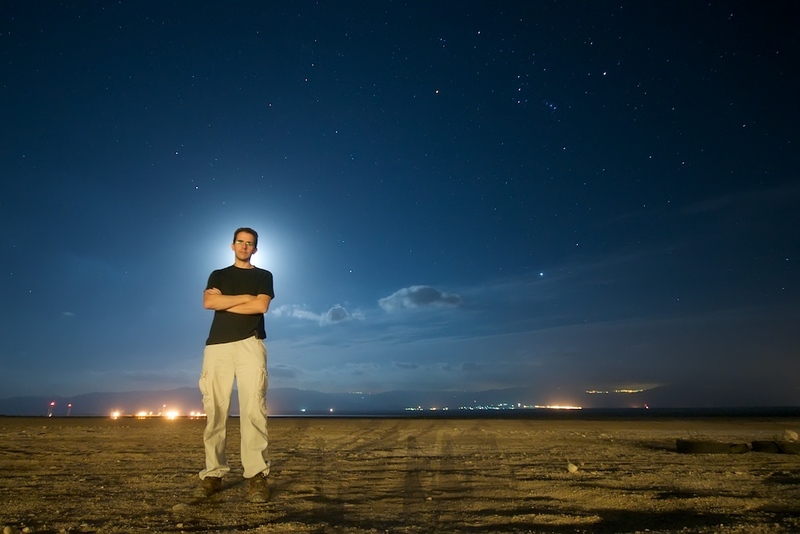 A 20sec long exposure at the Masada Airstrip (the lowest in the world, at 1250ft below sea level!). The light behind my head is the moon. The manmade lights behind are from Jordan. The southern tip of the northern part of the Dead Sea is just barely noticable. The constellation on the upper right is Orion. The warm temperature near the Dead sea made me think of a scientific question which buged me. How warm was the Mediterranean basin almost 6 millon years ago, when it all but completely dried up? (This drying up was named the Messinian Salinity Crisis). The quick answer would be that the temperature was higher by the adiabatic gradient (1°C/100m) times the depth. If the Mediterranean depression was 4km deep, and the average annual sea level temperature is 25°C (say around 70F), then the temperature at the bottom should be 25+4000m*(0.01°C/m) or typically 65°C. If temperature at sea level can at times reach 40°C, then reaching 80°C at the bottom of the basin is not unreasonable. But I wasn't sure this analysis pertains to such a large basin. Suppose that Earth had a radius which is 4km smaller. It would do nearly nothing to the climate (certainly not warm it by 40°C). The reason a depression can be warmer is because it is constantly supplied with air that had to descend into it, and heat adiabatically as it compresses. This is why the average annual temperature in the Judean hills at 800m above sea level (were Jerusalem is nested) is 16°C, but the average annual temperature at the northern end of the dead sea, just 1200m below Jerusalem, is about 25°C, or 9°C more. Of course, in the case of the dead sea, the air doesn't always descend from the Hills, and therefore it shouldn't always be warmer by the adiabatic gradient. Heating by the adiabatic gradient assumes that, the process is, as the name suggests, adiabatic. Namely, we assume that the air doesn't have enough time to cool, but if the basin is large, perhaps the radiative cooling is sufficient to keep the air from warming, while the air is at the basin. On a planetary level, this must be the case! So, the question is what is the critical basin size above which it can cool. Let us suppose that the basin has an area of roughly L2. The heat coming in is determined by the flux though the sides of the basin. where v is the typical wind velocity, Σ is the column depth (gr/cm2) and cp is the heat capacity of air. ΔT is the increased temperature of the air. where we have differentiated the Stephan-Bolzmann law. For a basin the size of (1500km)2 (which is of order the area of the mediterranean), we get Pheat ~ 6 × 1014 W, if we take a wind velocity of 1m/s, while Pcool ~ 2 × 1014 W. Note that the temperature increase cancels out. Thus, the adiabatic heating is certainly important. In particular, in basin floor near the walls were the adiabatic winds descend, temperature increases of 40°C are certainly possible, and maximum temperatures reaching 80°C are too. However, the average basin temperature will be somewhat less hot than our previous 25°C+40°C estimate, perhaps only 50°C. Since the cooling to heating ratio increases linearly with the size of the basin, a basin which is a few times larger would not be as warm, and the Mediterranean is about the largest basin size which can experience such large overall adiabatic heating. For Mars, things are different. Because the atmosphere is 100 times less dense, but the cooling rate is only twice as small, the typical size should be much smaller for the heating and cooing rates to be comparable. For comparison, the Hellas planitia is about 2000 km in diameter (and 7 km deep), and therefore it should not be as warm could be expected if it were adiabatically heated. And now for something completely different. Masada and the Messinian Salinity Crisis are unexpectedly related through a bit of history. Masada was conquered by the Legio X Fretensis (well, it wasn't really conquered because the 1000 or so occupants committed suicide so as to not fall into the romans, just before the romans could actually conquer it). Anyway, this legion is named after the Straits of Messina (Fretum Siculum), where it fought under Octavian (later known as Augustus Caesar) against Sextus Pompeius in the Battle of Naulochus, some 100 hundred years before Masada. This post is very interesting but, not being in the Maths field, I couldn't follow your reasoning at all. The only thing I did understand was that the adiabatic winds blowing into the basin would make it terribly hot, but further from the 'edge', so to speak, the adiabatic forces wouldn't be involved so the heating would be less extreme (caused only by the added pressure). Anyway, I loved how you used history to relate Masada and the MSC.